This post was authored by Marcin Noga with contributions from Jaeson Schultz. Have you ever thought about how security researchers take a patch that has been released, and then reverse it to find the underlying security issue? Well, back In July Microsoft released security bulletin MS15-072, titled: "Vulnerability in Windows Graphics Component Could Allow Elevation of Privilege (3069392)”. According to Microsoft, this vulnerability "could allow elevation of privilege if the Windows graphics component fails to properly process bitmap conversions.” Talos decided to have a deeper look at this vulnerability in order to better understand it, and this post describes the details of this process so that our readers may gain a better understanding of how this is done. What does the RtlAllocateHeap "size" value consist of? Where is this API called? Microsoft helpfully includes a list of files updated by the patch. Checking the file list in KB3069392 we find that the vulnerability is located in Gdi32.dll. Knowing all necessary facts at the beginning we can start further investigation. Prior to the patch for MS15-072, the most recent changes made to gdi32.dll happened back in April 2015 as a result of MS15-035. For analysis purpose Talos downloaded security patches from both bulletins dedicated for Windows 7 SP1 X86. a) Patches against integer overflows with usage of Intsafe.h functions. b) Patch to disallow passing a zero value in the 14th parameter to the NtGdiStretchDIBitsInternal syscall. After performing a deeper analysis of each of these functions, one of them, GdiConvertBitmapV5, stands out in significant way because the integer overflow in this function leads directly to a heap based buffer overflow. Additionally, this same function is part of an exported Application Program Interface (API) called by other API’s from different DLL’s, dramatically increasing its chances for exploitation. Looking at this function name and googling a bit, it is easy to obtain more information about the purpose of this function, and its parameters. The general purpose of this function is to convert a DIBV5 image into either a DIB or BITMAP, depending on 4th parameter. Let’s try and understand where the bug is, and how we can trigger it. In the above screenshot (focus on the patched side) we can see that all calculations made on parameters which take a part of calculation "Size" value for RtlAllocateHeap API are wrapped into IntSafe function calls. A quick glance on right side of screenshot and we see that the size parameter for RtlAllocateHeap is a result of adding three values without any check against integer overflow. That's the place where we will try to gain overflow and later abuse it. Now let’s examine the unpatched function body, and try to determine how we can control significant parameters and where later potential writeAV will appear. Because we are going to explore code around RtlAllocateHeap and its related parameters we note that a call to this API is made inside the IF instruction on line 117. To trigger the overflow vulnerability, the GdiConvertBitmapV5 function needs to convert DIBV5 to DIB, so format parameter needs to be set to CF_DIB. 3. What does the RtlAllocateHeap "size" value consist of? Depends on Line 123 its value can be 12 or Size. We will control code flow to give us possibility to easily manipulate the Size variable value, in Line 95. In that way Size will be multiplication of bV5ClrUsed field and 4. - v8 is a result of cjBitmapBitsSize( GdiGetBitmapBitsSize ) [it's one of the function that was also patched against IO]. Without going into details, the following parameters are used in this function to calculate results value: biSizeImage, biWidth, biHeight, biPlanes,biBitCount. As you can see above, and also after taking a glance into the code, there are many ways in which we can control parameters to trigger the integer overflow. 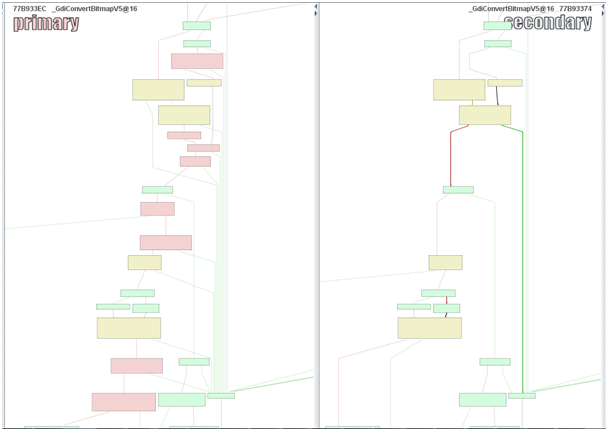 The first write to the buffer allocated by RtlAllocateHeap where IO occurred is in line 196, but it is just a header copying. So controlling content with desirable values can be hard, taking into account that values need to be chosen in a way to trigger IO. Is better to allocate more than 40 bytes data so we don't corrupt the heap there. Lines 216, 218, 225 look more promising. It's time to create PoC. As an example, below is a PoC that triggers a heap overflow in line 218 of the vulnerable code --where we find a memcpy based on the Size value. Size value is calculated in line 95, where mostly it is based on the bV5ClrUsed field. Let’s debug it and focus on the most important parts. Corrupted with bunch of 0x41 ('A') as expected. 7. Where is this API called? 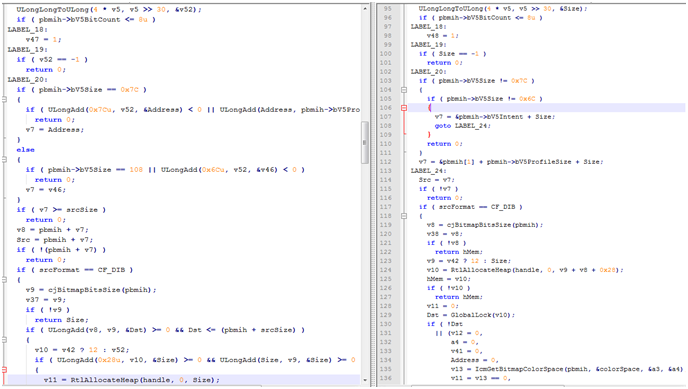 We see above that indeed a malformed DIBV5 image during conversion to DIB can trigger a heap based buffer overflow in the GdiConvertBitmapV5 API. But, where exactly in Windows components / applications this API is called? It's an exported function, indeed, but not a public one. It turns out that GdiConvertBitmapV5 is used by user32.dll in GetClipboardData. force application to grab malformed image from clipboard via GetClipboardData with CF_DIB parameter. "Vulnerability in Windows Graphics Component Could Allow Elevation of Privilege (3069392)". Therefor this kind of attack is quite obvious: Applications with low privilege can put a malformed DIBV5 into the clipboard and induce a high privilege application/service to pull out data with proper format and, in the process, trigger the heap overflow. Is there a convenient way to trigger this vulnerability remotely? What about modern Web Browsers and technology related with them? Looking at support for clipboard manipulation in modern browsers, we see that all of them provide support for it with less and more functionality. The standard that web browsers are supposed to follow can be found here. A closer examination of the clipboardData interface informs us that it is very limited as we would expect. In all browsers you can't directly control the native format parameter during the process of copying data to the clipboard, and a similar scenario exists when you try to extract the clipboard data. Doing short research Talos did not find any intermediate way to force browser to copy image into clipboard in DIBV5 format. What about other technologies like Flash, Java applets, Mozilla XUL, etc.? This case looks similar: Access to clipboard is limited to basic formats, needs special privilege assigned by user or is completely blocked. MS15-072 reminds us how interesting and dangerous data manipulation/transfer via clipboard can be. In Talos’ limited amount of research using web browsers, we did not find a way to control the native format parameter, which greatly limits the exploitative properties of this vulnerability. Finding a way to trigger it, of course depends on the technology, and we have not explored all the ways that programs may interact with the Windows clipboard. This the life of the security researcher. In order to determine the exploitability of a vulnerability we must fully understand the issue. No matter whether a vulnerability is exploitable or not, the extra knowledge gained through reverse engineering helps Talos provide comprehensive protection against emerging threats.